Fine art reproduction of original oil painting. 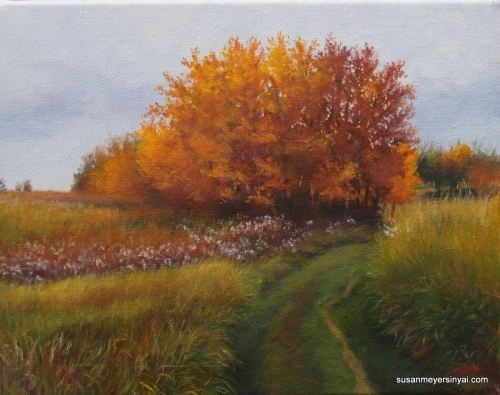 Canadian Landscape, beautifully reproduced on either gallery wrap canvas, or standard canvas. Indian summer day in Edmonton, Alberta. Shipping included in price. Limited edition, fine art reproduction of the highest quality on archival Hannemuhle paper. 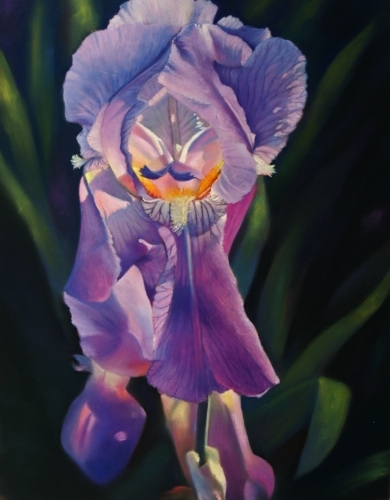 All pastel work is reproduced on paper in order to replicate the original painting of this beautiful iris. Price includes tax (if applicable) and shipping within the US. Certificate of Authenticity provided. Fine art reproduction of the highest quality. Limited edition on stretched canvas. Absolutely archival. Often in my dreams I walk down a beautiful path towards an unknown destination. 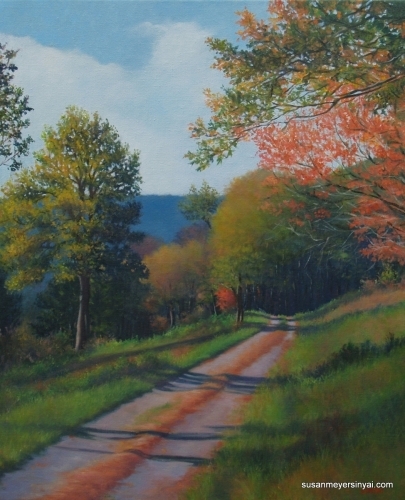 When I come across such a path in reality, like this one in the Virginia mountains, I am inspired to create a painting that depicts the lovely moment of discovery as well as the mysterious unknown. Price includes tax (if applicable)and shipping within the US. Certificate of Authenticity provided. 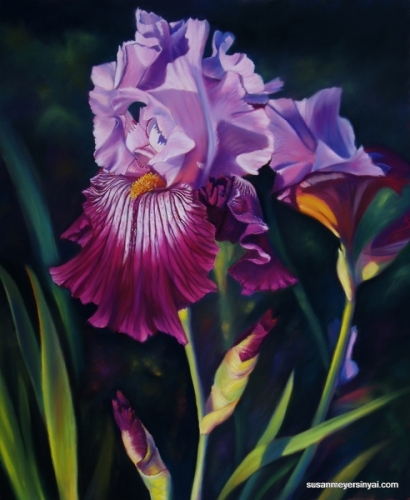 Fine art reproduction of the highest quality of original pastel painting on Hahnemuhle Photo Rag paper. Absolutely archival. Limited edition. I reproduce my pastel pieces on paper so they remain true to the original. This is a late afternoon moment - warm sunshine, long shadows on the hayfield. I was captivated by not only the light, but the geometric shapes.Tax ( if applicable) and shipping within the US included in price. Certificate of Authenticity provided. Fine art reproduction of the highest quality on stretched cotton canvas. Limited edition, absolutely archival. 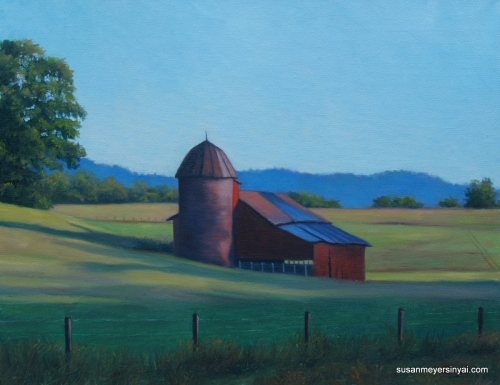 Another beautiful rural scene close to Charlottesville, Va. Price includes tax (if applicable) and shipping within the US. Certificate of Authenticity provided. 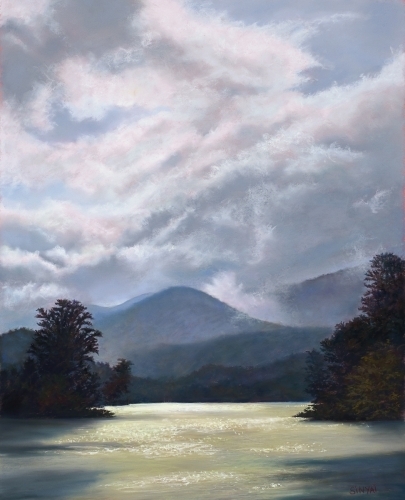 Fine art reproduction of the highest quality of an original pastel painting on Hannemuhle paper. All pastel paintings are reproduced on paper to remain true to the original. Limited edition, absolutely archival. 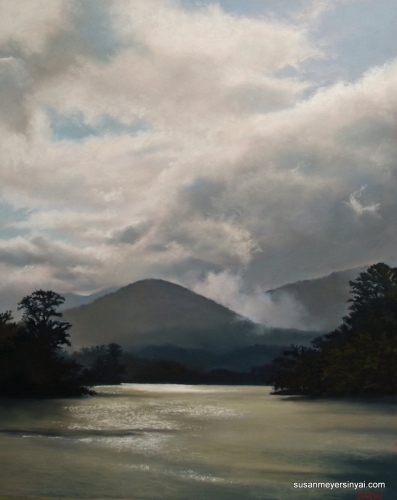 I loved the silvery lighting on the water and the misty clouds surrounding the mountains. 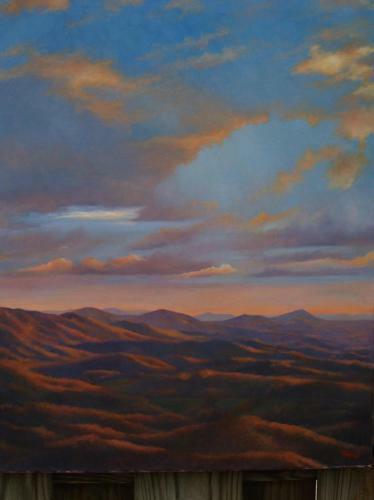 Scene is from Asheville, NC. Pricing includes tax (if applicable) and shipping within the US. Certificate of Authenticity provided. Fine art reproduction of the highest quality on stretched canvas ready for framing. Limited edition, absolutely archival. 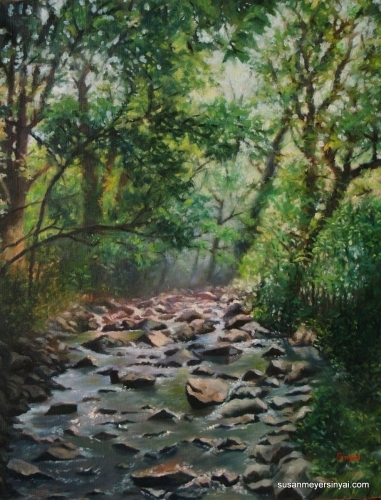 Lovely scene with the cool morning light filtering through the trees and lighting the rocks and water. Scene in Asheville, NC. Pricing includes tax (if applicable) and shipping within the US. Certificate of Authenticity provided. Fine art reproduction of the highest quality of an original oil painting on a stretched canvas ready for framing. Limited edition, absolutely archival. This painting for me was all about the color and the light. The pears and the cloth helped me to explore those two things. Price includes tax (if applicable) and shipping within the US. Certificate of Authenticity provided. 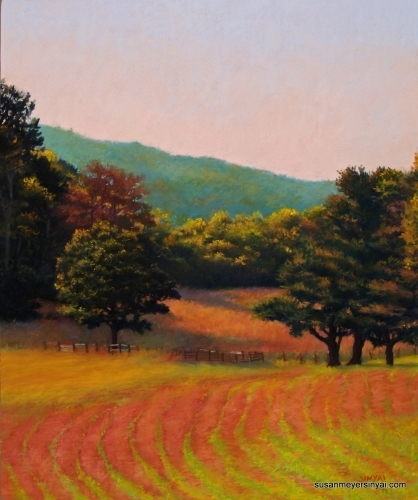 Fine art reproduction of the highest quality from an original pastel painting, reproduced on Hahnemuhle Photo Rag paper. Limited edition, absolutely archival. 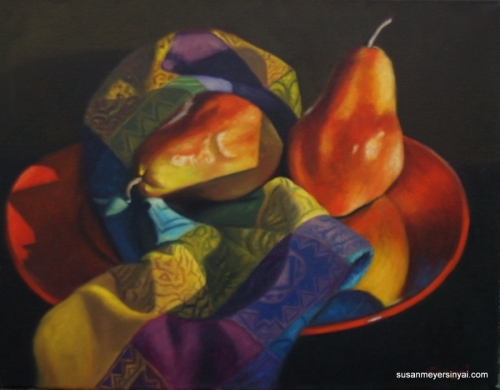 All pastel paintings are reproduced on paper to achieve the maximum similarity to the original. I was struck by the pattern of the freshly mowed grass, and the effect of the late afternoon sun on the colors. Price includes tax (if applicable) and shipping within the US. Certificate of Authenticity provided. This is a limited edition, high quality reproduction of my original pastel painting, reproduced on Hahnemuhle Photo Rag paper. Absolutely archival. Another interpretation of the scene from "Early Bird." This is a bit lighter, as the sun had risen some more, and the clouds are more active. This is also larger. All reproductions of pastel paintings are done on high quality photo rag paper to remain true to the original. The image has a 2" white border for easy framing. Price includes tax (if applicable) and shipping within the US. Certificate of Authenticity provided. 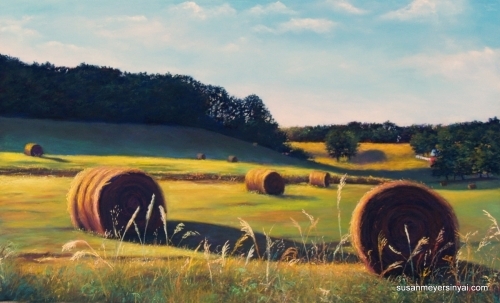 Giclee reproduction of original pastel painting. This is a signed, limited edition reproduction of the highest quality, perfectly color matched to the original piece and reproduced on heavyweight Hahnemuhle Photo Rag paper. It is completely archival. Shipped flat. Price includes shipping, and tax, if applicable. This is a limited edition reproduction on canvas of the original oil painting which is 30 x 24. It is a magnificent sunrise view off the deck of Laurel Point, a fabulous VRBO in the Virginia mountains - one can truly see almost forever! This is a stunningly accurate reproduction, totally archival. Other sizes available: 20 x 16 and 25 x 20. Also available in gallery wrap. 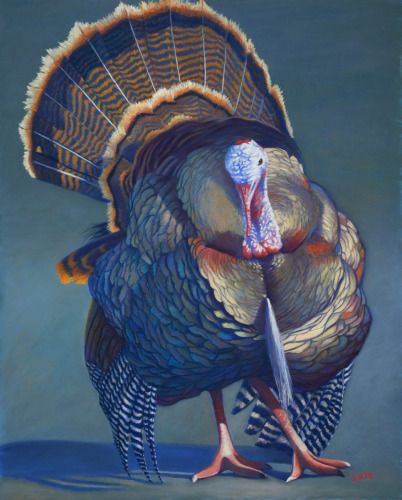 This is a reproduction of a commissioned pastel "turkey portrait," completed for a friend who shares my admiration for the irridecent colors displayed by the male wild turkey when he is looking for love. Available in original size, as described below, but also in other sizes upon request. Please contact artist for pricing on different sizes.